PHOENIX — Respiratory syncytial virus, a highly contagious respiratory illness in young children, has jumped by 234 percent from last year, according to documents from the Arizona Department of Health Services. This increase is affecting families across the Phoenix area as young children show signs of what at first appears to be a common cold that quickly transforms into a virus that affects the lungs, heart or immune system. In the 2013-2014 cold and flu season, there were 783 laboratory-confirmed cases of RSV. The number of confirmed cases shot up to 2,613 this year, a number that could continue to climb through the end of the season, according to hospital administrators. 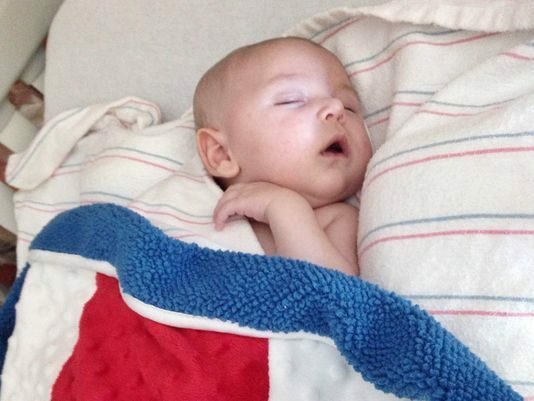 Erin Able, an Arizona mother of a 6-week-old child, had no clue that her son had RSV or the seriousness of the virus until her baby was taken in an ambulance to the hospital. “Tuesday morning at 7:45 I went in (to the doctor’s office), and they were like, ‘We’re going to call an ambulance,’ ” Able said. 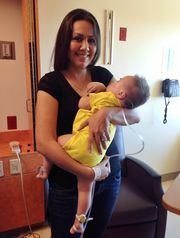 Her son Atlee’s oxygen levels had gotten so low that he had to be rushed to CardonChildren’s Medical Center in Mesa, where he was diagnosed with RSV and the flu. Able said that on Tuesday morning Atlee looked a little bluish, was extremely lethargic and had no appetite, and that it all came on very quickly. Atlee may have caught RSV from his three other siblings or even from his mother. Adults can carry the virus, which appears as a common head cold but can be passed on to a child as RSV, said nurse Kimberly Byrne, the pediatric asthma program manager at CardonChildren’s Medical Center. The other symptom Able described was the difficulty in her child’s breathing. “I could see when he was laying down that it was really hard to breathe,” Able said. Bryne explained further. “When babies breathe fast for a long time, they will stop breathing because their muscles and their stomach are not as fast as an adult,” she said. When a child breathes and you see the skin going underneath the rib cage or clavicle, that means that child is using other muscles to keep breathing, Byrne said. These are all major signs of respiratory distress and that the child needs oxygen. Just down the hall from Atlee, another mother said she wished she had taken her young son to the hospital as soon as she saw his labored breathing. Carmen Saavedra said her 14-month-old son, Edmundo, was initially misdiagnosed with pneumonia before doctors realized he also had RSV. “Prior to going to the ER, we thought it was just a cold,” Saavedra said. Saavedra saw that the antibiotics were not working and rushed her son into urgent care when she saw his 103-degree fever.